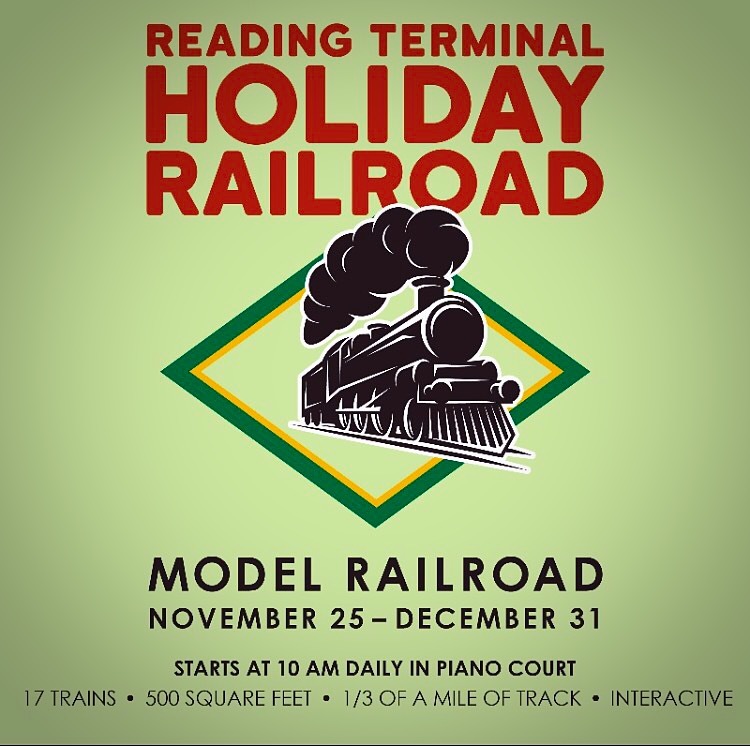 Holiday Family Fun in Philadelphia: Check out some of the mostly FREE fun family events happening in Philadelphia this holiday season. 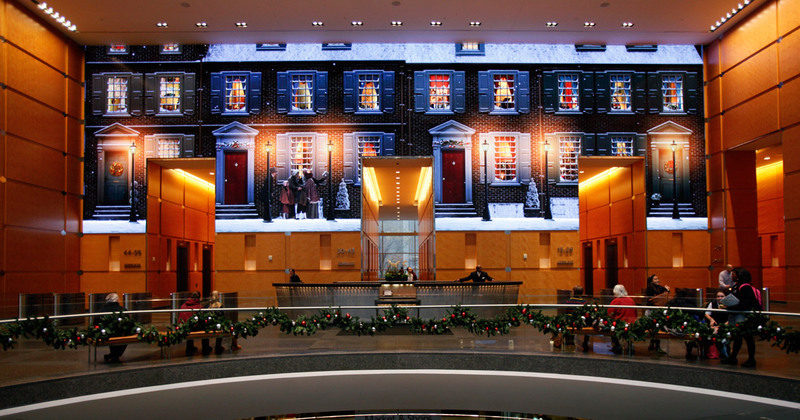 Shown on the state-of-the-art Comcast Experience video wall at The Comcast Center, The Comcast Holiday Spectacular is filled with sights and sounds of the season. Since its debut in 2008, more than 1.6 million people have experienced the wonderful must-see holiday show in the Comcast Center lobby. Now an annual holiday tradition, the 15-minute Comcast Holiday Spectacular takes visitors on a festive, musical journey featuring classic family favorites like Carol of the Bells, Jingle Bell Rock, and The Twelve Days of Christmas. The show also includes a snippet of The Nutcracker performed by the renowned Philadelphia Ballet. Adding to the experience, the family friendly show features a magical sleigh ride from the Philadelphia countryside to high above the city skyline, made all the more breathtaking by the massive Comcast Experience video wall. Kids and adults alike will delight in this 500 sq.f. 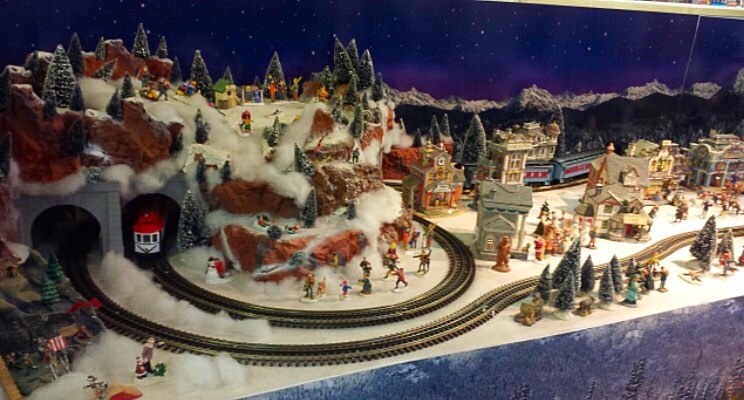 model railroad display with seventeen working train lines running on almost a third of a mile of track! 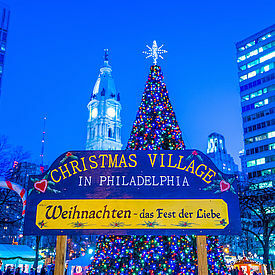 Experience the magic of an authentic German Christmas market right here in Philadelphia! 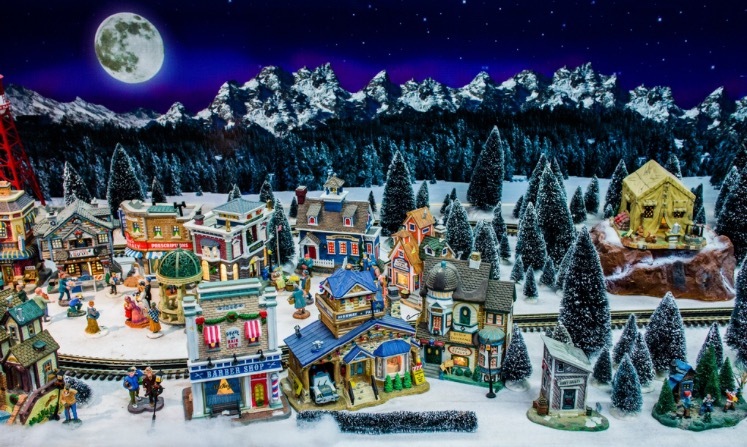 Christmas Village will be running from Thanksgiving through Christmas Eve, that’s Nov 24th through December 24th in 2016 with a special preview on Saturday, November 19 and Sunday, November 20. 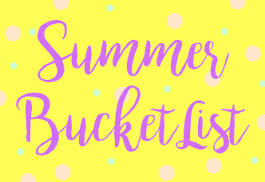 CHECK OUT ALL THE KIDS EVENTS HERE! Light Shows Runs from the day after Thanksgiving through December 31. Showtimes: 10am, 12pm, 2pm, 4pm, 6pm, 8pm. The Store is closed Christmas Day. The day after Thanksgiving thru December 31 (Closed Christmas). 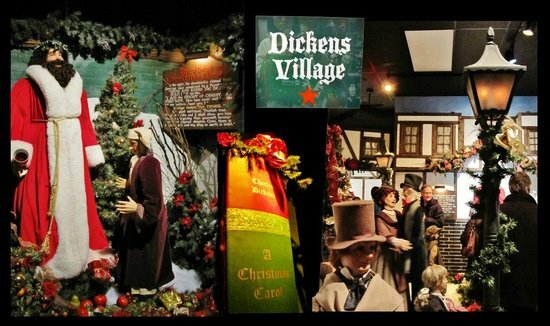 A Philadelphia tradition for more than 20 years, the third floor of Macy’s is transformed into “Dickens Village” for the holiday season. 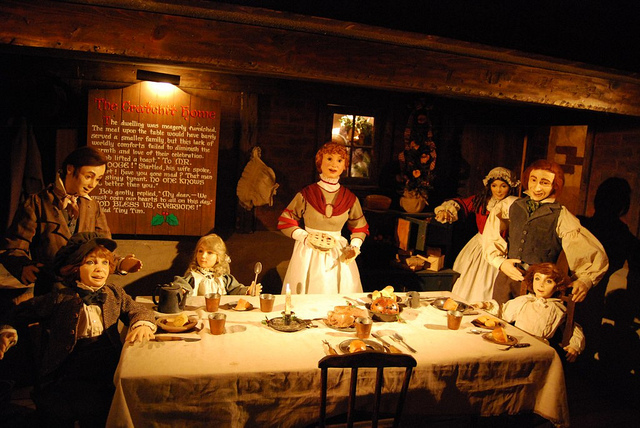 The 6,000-square-foot Village on the 3rd floor of Macy’s Center City brings Charles Dickens’ classic A Christmas Carol to life with more than 100 fully animated figures reenacting 26 of the story’s most memorable moments. 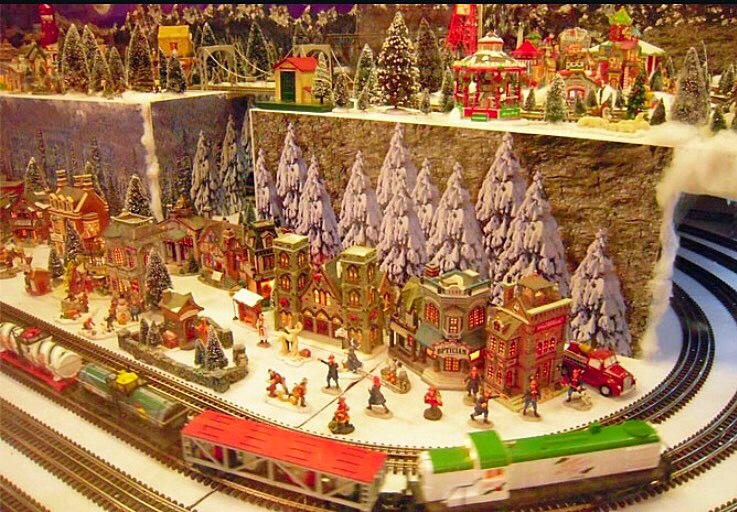 The Village is open daily, excluding Christmas. 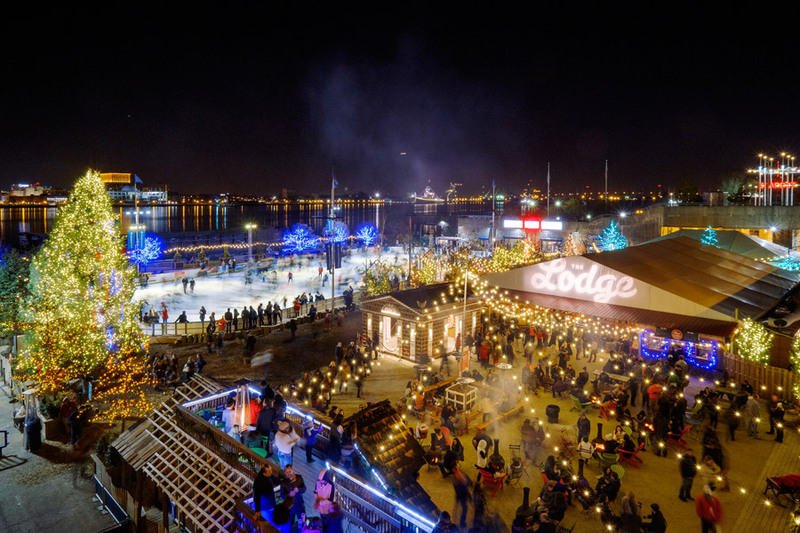 Blue Cross River Rink Winterfest transforms Penn’s Landing into a winterized riverfront park. A cold-weather version of the rollerskating oasis Blue Cross River Rink Summerfest, Winterfest houses an Olympic-size skating rink overlooking the Delaware River, a ski chalet-style lodge and winter garden with a majesticly lit holiday tree (over 100,000 LED lights! ), an outdoor seating area with fire pits, cozy warming cabins, a kids’ lodge with arcade games and more. Now in its 23rd year as an outdoor ice skating rink and fourth season as Winterfest, Blue Cross RiverRink is the only outdoor regulation-sized rink in Philadelphia. The experience of Winterfest as a whole is an annual favorite among those of every age, offering plenty of special events throughout the season as well as daily entertainment, food and drinks. Warm up at The Lodge Restaurant and Bar, an onsite, ski chalet-style tented area offering indoor fireplaces, comfy couches, arcade games and plenty of heated warmth amdist a rustic atmosphere. The Kids Lodge, has a variety of interactive arcade games and a selection of small rides. With a floor carpeted in rubber mats, kids can partake in a game of pinball, Skee-Ball, air hockey and more without ever having to take off their skates. Franklin Fountain’s Confectionery Cabin brings a ton of sweet treats to Winterfest this season as well. Blue Cross RiverRink Winterfest is open seven days a week, including all holidays, from November 25, 2016 to March 5, 2017. Note: Sponsored by Independence Blue Cross, all Independence Blue Cross cardholders receive free admission to the skating rink. Click the button below for hours, admission prices and skate rental prices to the Blue Cross RiverRink. 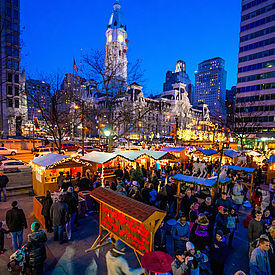 As the weather cools, action at cold-weather attractions heats up in Philadelphia. On Friday, November 11, the Rothman Institute Ice Rink at Dilworth Park will reopen for its third year of seasonal skating. 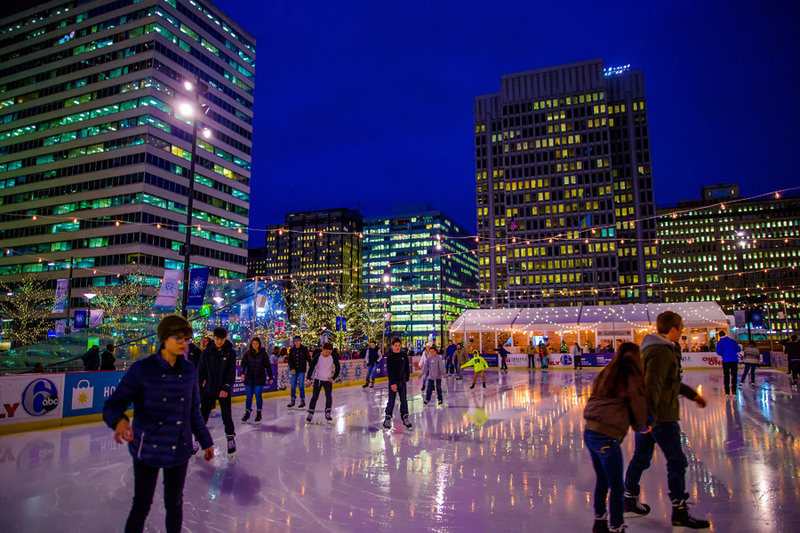 Those looking to ice skate in the heart of Philadelphia can pack up their cold-weather gear and head to the rink at Dilworth Park, where skyline views await just outside of City Hall. the Rothman Cabin will once again offer a heated tent, located at the tip of the ice rink. Enjoy hot, seasonal cocktails, a variety of craft beer and a food menu from Air Grille by Brûlée Catering, including hearty items like poutine and chili. 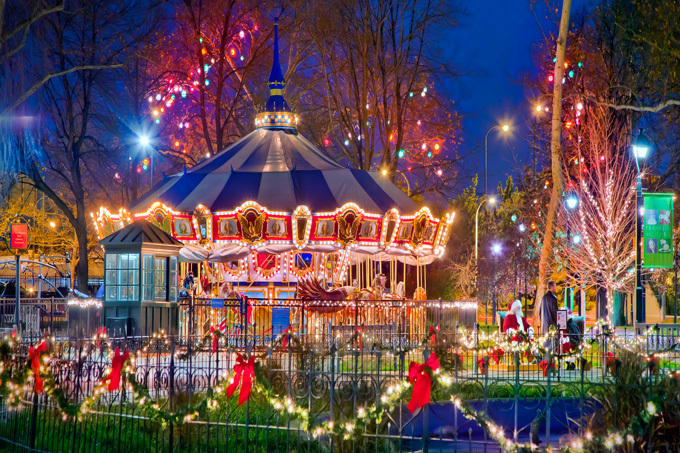 Festive lights, winter treats and holiday cheer will fill historic Franklin Square all season long for its all-ages (and completely free!) holiday festival and light show. With the spectacular Electrical Spectacle light show as its main feature — the show employs more than 50,000 (!) 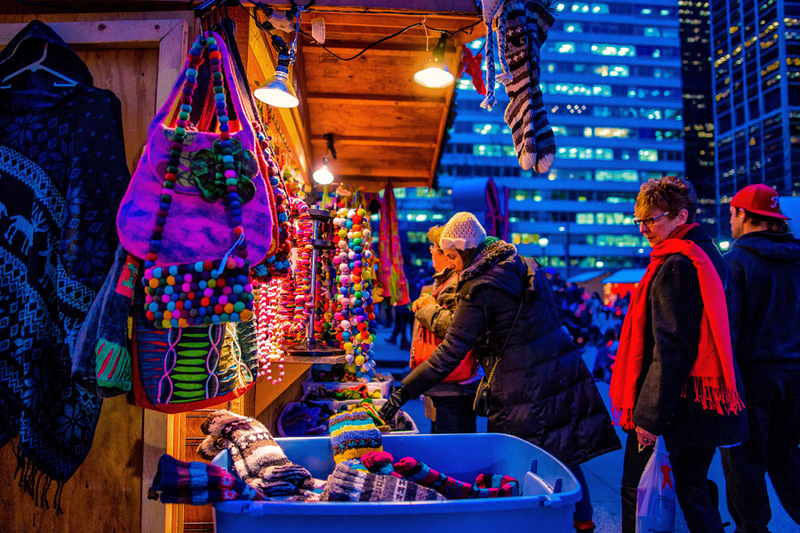 twinkling lights and dynamic holiday soundtrack — the seasonal outdoor attraction rounds out the ongoing festivities with a winter beer garden, holiday shopping, themed events and more. The free holiday light show at Franklin Square returns with more than 50,000 lights set to a soundtrack of holiday tunes including those by the Philly Pops. The centerpiece of the shows is a 12-foot tall kite that serves as an ode to Benjamin Franklin’s famous kite-and-lightning experiment, hovering 16 feet above the square’s centerpiece fountain. LED lights dance to music all along the kite, spreading holiday glow throughout the park. Show Times: Two alternating shows take place every 30 minutes will take place each night beginning at 4:30 p.m. and continuing until 8 p.m. on Sundays through Thursdays and 9 p.m. on Fridays and Saturdays. The festival will feature nearly seven weeks of attractions, activities and more. 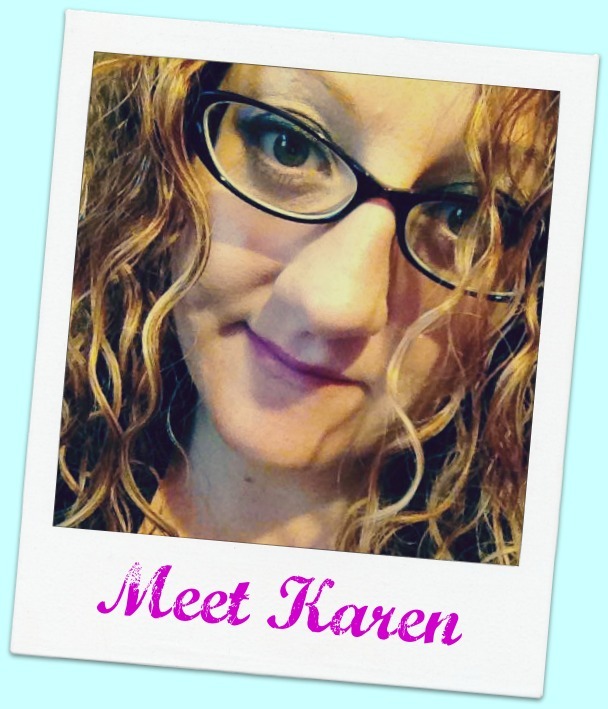 Read on for more info. Franklin Square kicks off its festival November 10, 2016 at 5 p.m. with Taste of the Holiday Season, a night where Benjamin Franklin and characters from both Star Wars and Frozen will make an appearance alongside musicians from The Philly POPS set to play into the evening. Ben’s Sweets and Treats and Other Edible Eats + Winter Beer Garden: New this year, Ben’s Sweets and Treats invites visitors to come out and watch homemade fudge be created on-site, decorate holiday cookies and garner tips on how to assemble the perfect gingerbread house. Fresh donuts will also be whipped up each evening, and a Candy Trail welcomes kids of all ages to fill a bag with treats. A heated tent will serve up seasonal favorites like hot chocolate, warm cider and egg nog for you to keep warm in between shows, and SquareBurger will offer a menu of burgers, hot dogs, fries (including cheesesteak fries! ), vegetarian options and other family friendly eats. The signature Cake Shake blended with Tastykake Butterscotch Krimpets® will continue to delight tastebuds, along with a changing shake-of-the-month (i.e., Candy Cane Shake). Pair it with the burger-of-the-month (i.e., Holiday Turkey Burger) for a true holiday treat. Warm seasonal additions to SquareBurger’s menu include chicken noodle soup, mac and cheese, churros and more, made specially for the Franklin Square Holiday Festival. Alongside SquareBurger is the Winter Beer Garden, where you can relax in the warmth of outdoor fire pits and enjoy a variety of seasonal beverages, local craft beers, wine and specialty cocktails. 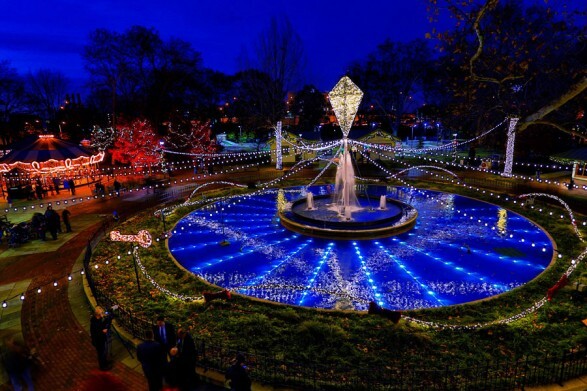 The Electrical Spectacle Holiday Light Showpresented by PECO returns to Franklin Square! 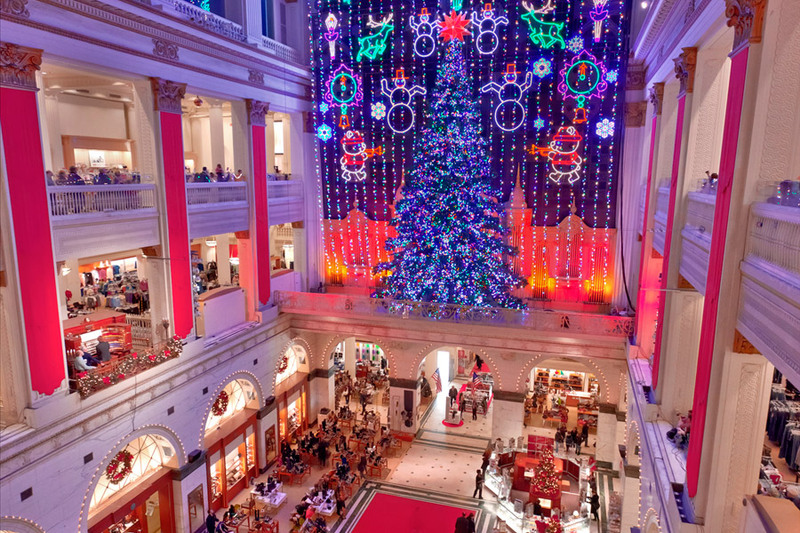 Plan your visit to Philadelphia’s favorite holiday tradition, featuring plenty of family fun, delicious comfort foods, and special events! Visit the Betsy Ross House courtyard during Historic Holiday Nights in Old City. Marvel at the new Old City District Design Tree, an artistic lighting installation that celebrates the season with a nod to the neighborhood’s strong history of art and design. Enjoy festive performances, extended hours until 8 pm, and $1 off admission Thursday nights to see Betsy herself! Meet two female entrepreneurs and learn how women played an active role during the American Revolution – from making important military supplies, like flags and musket cartridges, to choosing “patriotic” beverages like chocolate and coffee, rather than tea. Sample the hot chocolate drink that colonists enjoyed. Sponsored by AMERICAN HERITAGE® Chocolate. Sunday, December 31, 1 pm – 3 pmCelebrate Betsy’s 265th birthday with cake provided by City Tavern, Colonial Chocolate Making demonstrations and crafts for kids. Cupcakes are limited to a first-come, first-served basis. FREE. Departs from the Betsy Ross House, 239 Arch St.
It’s the most wonderful time… for a beer! Raise a glass of cheer on Once Upon A Nation’s Colonial pub crawl through Historic Philadelphia. It is 1777 and the British are occupying Philadelphia…will there be holiday celebrations during this tumultuous time? Step with us into the holiday season in charming Old City, circa 1777, whilst enjoying winter brews and festive libations. Departs from the Betsy Ross House, 239 Arch Street. Hit the streets of Historic Philadelphia with Ben and raise a toast to Philadelphia’s favorite Founding Father in honor of his 312th birthday! Delight in lighthearted toasts and spirited songs, delivered by the famous inventor and statesmen himself, and enjoy savory snacks and seasonal beverages. Audition for Once Upon A Nation! Historic Philadelphia, Inc. (HPI) seeks adult actors (ages 18 and up) of all ethnic backgrounds to work as Storytellers, tour actors, and first-person costumed interpreters for our many outdoor spring educational and summer programs in Philadelphia’s historic district as well as at Valley Forge National Historical Park. Part-time paid seasonal work, starting February 2018. Pay starts at $12.00 per hour. Housing/transportation not included. Candidates will be invited to attend auditions to be held on January 19, 2018, based on how well their resume reflects the experience and skills needed for our programs. Submission deadline is December 19, 2017. No phone calls, please. Historic Philadelphia is an Equal Opportunity Employer. 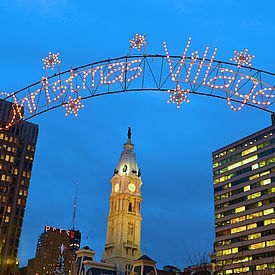 Photo Credit: Visit Philly check them out for lots more fun Philly events.